Thanks so much for visiting my blog. Yes, you are doing it right. The top just sits on top without any adhesive. If you are wanting the top to be a little more secure, you can tie a ribbon from the bottom up the sides and make a bow on top like a little package. You would not need the eyelet and ribbon on top if you did it that way but it would make your top secure. I hope this helps. Let me know if you have any questions. I'd love to see your finished project. Becky, thanks for sharing this cute idea. 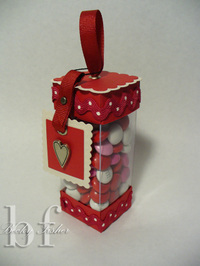 I just made one and posted it to my blog (http://DanniesDesigns.typepad.com). I made sure to link back to your blog so people could see your wonderful directions. Thanks again! Love this little box. I have one question. What did you use to tape the acetate box together so the tape isn't showing? I was thinking you used a clear tape. Fantastic box, Becky! Wonderful creation and thank you so much for sharing it! This is really cute...great blog, too! Hey girl, great little treat box. As always, Becky, your stuff rocks! Today (December 1/ 08) I posted an entry on my blog with a link to this tutorial. Probably a good idea if you knew the URL for my blog!